This is not a broken turboprop engine. It's a new radical new aircraft engine design by French engine manufacturer Snecma, one that will forgo the traditional bypass system and remove the engine ducting altogether while reducing fuel consumption, greenhouse gas emissions, and engine noise. 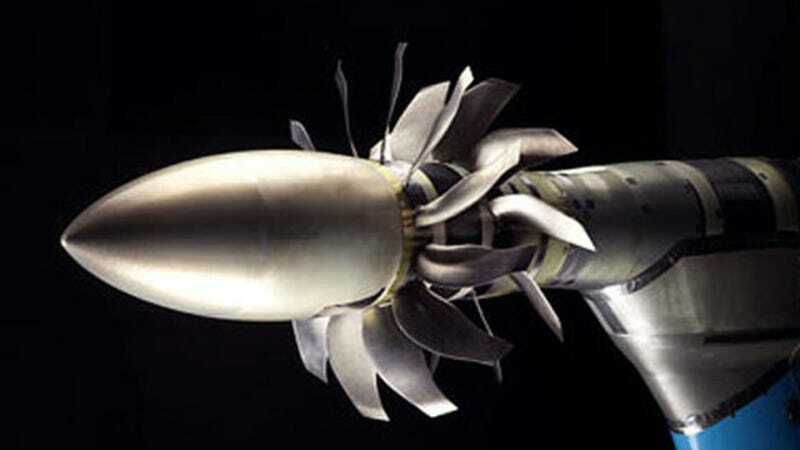 Modern aircraft engines rely nearly exclusively on turbofan technology, which allows a portion of its incoming air to bypass the engine's combustion chamber and generate additional thrust when expelled with hot, compressed exhaust gases. However, the prototype engine above completely does away with the ducting found on conventional engines, instead allowing the counter-rotating fans to spin in open air. "An aircraft engine's efficiency and consumption depend on the amount of air the fans draw and eject at slow speeds," Snecma Research & Technology Director Pierre Guillaume said in a press statement. "With the open rotor, we will be able to considerably increase that drawn air flow because we won't have any ducting around the fans. And that will improve consumption and cut CO2 emissions." What's more, the current 1:5 scale prototype engine is already testing at 10 dB below the noise levels of conventional engines, about what CFM's LEAP engines currently produce.